Jennie Bennett, A Writer's Journey: What was that again? Ah, words. There are so many different ways that we can use them. They can evoke every emotion known to man (and then some) today I have chosen to evoke one of those emotions to get your day started. Which emotion? Why, the happy one, of course! Hope that makes your Monday a little brighter! The Screen Name one is cute. 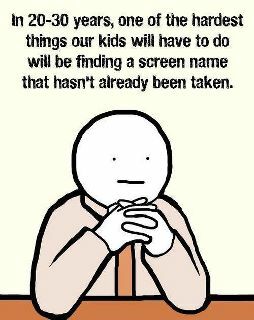 I've read where parents often now reserve the domain names of their children right after they're born! Brilliant! Especially the Haiku one. I love the first two. Brilliant. I want an Avada Kedavra key too. LOL! Totally made my Monday morning. I'm cracking up! Good way to start the morning! Hey J.A. It was good to meet you this weekend! Also funny pictures. 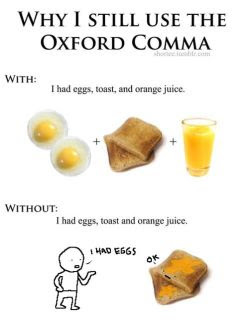 I also try to always use the oxford comma!!! That poor orange juice & toast, so misunderstood! Excellent way to start a Monday. Ha! So great. Where can I get that haiku? Definitely gave me a smile. Especially the Avada Kedavra. Needed it today. I loved the Avada Kedavra one and Oxford commas. I love oxford commas. I get totally confused when they are left off. I tried to write without them for a while but I had to go back. It might be an addiction. That Avada Kedevra key would be so dangerous in my hands. Mainly because I would hit it by accident way too many times. BTW, Otto had me rolling. 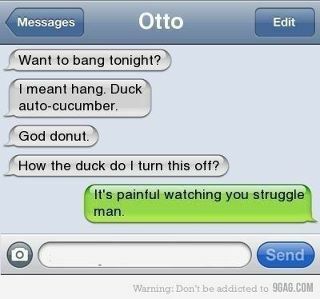 Poor guy and his auto-cucumber. lol!!! ha ha. those pics cracked me up. I need the Avada kedrava on my keyboard! Oh, I just spit coffee out. The auto-cucumber...well-played, J. Also, I use the Oxford comma because of my parents, the Pope and Mother Theresa. woot! thanks! love the problem of the future, it's already here!